Jessica Hart shows off her toned figure! She appeared in the 2009 Swimsuit Issue of Sports Illustrated, and four years later, Jessica Hart is still sporting the same terrific physique. The Australian model is the new face – and body – for Calzedonia swimwear, featuring in their full summer fashion campaign in an array of bikinis and beachwear items. Totally in place on the sand, Jessica, 27, looked every bit the surfer chick. The various swimsuits vary from bandeau and high-waisted briefs, to halter-necks and side tie bottoms. But no matter the shape or colour, all of the beach items look amazing on Jessica. ‘It’s just part of my life. I run, cycle, do pilates, work out in the gym … everything really. I try and mix it up to keep it interesting but it’s just part of my job. ‘We have to look good and you never know in this industry when it all might just go away.’ Clearly the effort has paid off for the model who is obviously fronting this swimwear campaign, and getting dressed by top designers for events, including the Met Ball last week. 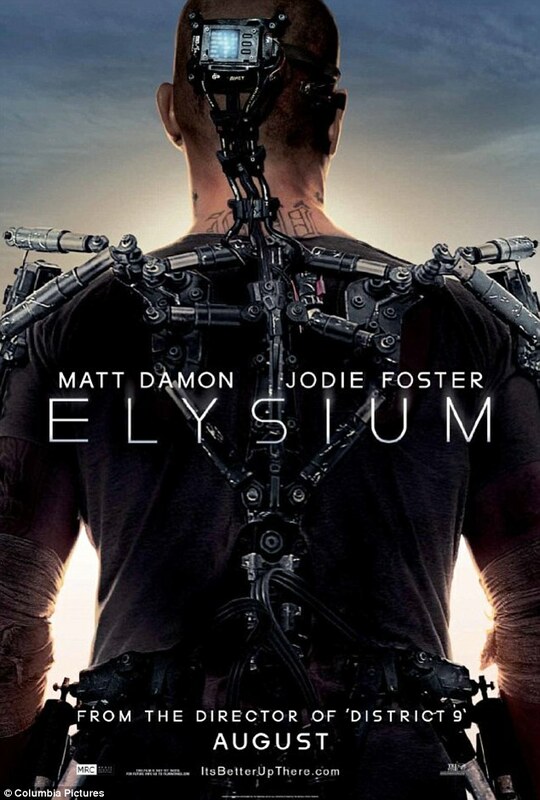 The 42-year-old actor stars as a muscled tough guy named Max in Neill Blomkamp’s forthcoming sci-fi drama Elysium. 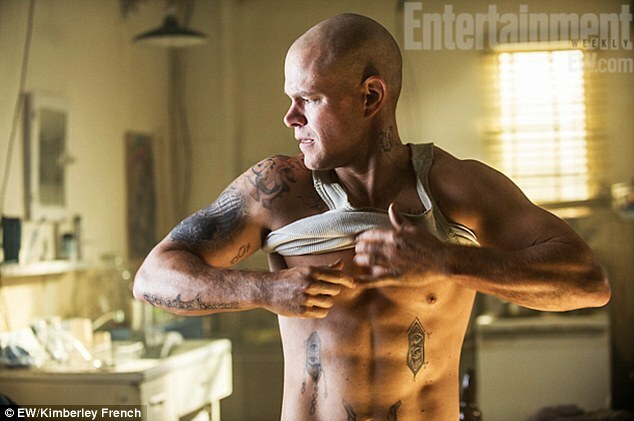 A newly-released promotional shot obtained by Entertainment Weekly shows the action star revealing his rock hard abs, decorated with tattoos, as he prepares to invade a space station – home to a utopian society which has left humans for dead on Earth. Blomkamp described Max as the ‘archetypal character who just grew up on the wrong side of the tracks but isn’t a bad guy’, in an interview with EW.com. ‘The idea is that they grew up in this gang environment so each tattoo does have a personal meaning to the character,’ the actor added. 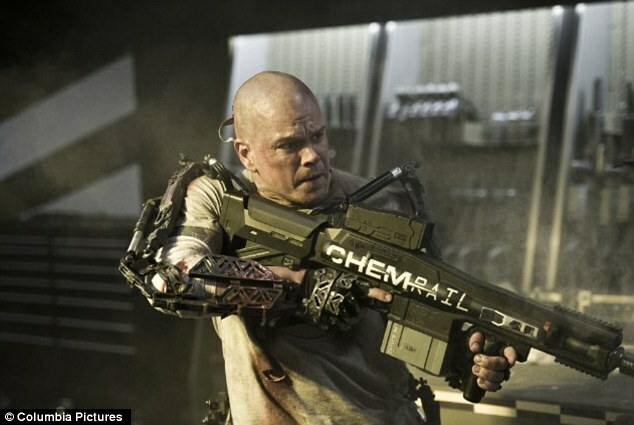 The star revealed the vision for the character, who wears an exo-skeleton ‘hulk-suit’ meant he had to bulk up substantially for the role. He was also concerned about getting injured. The Good Will Hunting hunk drastically lost weight for his roles in The Talented Mr Ripley and Courage Under Fire, before beefing up again for his iconic part as Jason Bourne. At the time he said: ‘It’s just really hard work… I’ve lost tremendous amounts of weight in my life and there’s just no secret. ‘I did it before the days of getting a nutritionist and chef, you just got to run 13 miles a day with six and a half in the morning and six and a half at night. ‘You can never take a day off and, for four months, you eat nothing but chicken and egg whites and broccoli and no butter anywhere. ‘I was lucky, because my first big running job was with Franka Potente on the first Bourne,’ he recalled to EW. In preparation of the Steven Soderbergh film, he said: ‘I just stopped working out and basically just ate whatever I wanted. Ashley Tisdale’s love of exercise rubs off on her boyfriend as they step out in his and hers gym gear. 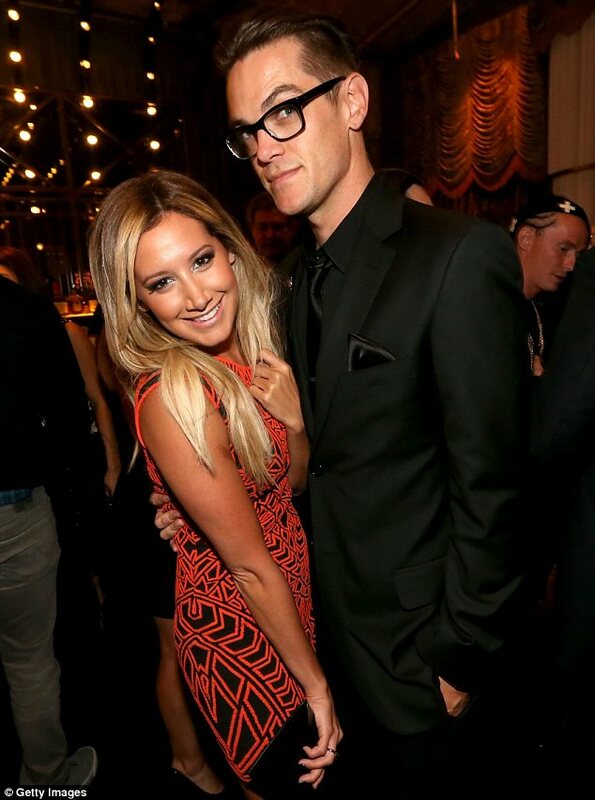 He’s a rocker and she’s a saccharine sweet former Disney princess, so it’s safe to say Ashley Tisdale and her boyfriend Christopher French aren’t exactly cut from the same cloth. But the cute couple appear to have found common ground in the form of a mutual love of exercise. Ashley has long been a fitness fanatic and seems to work out on a near daily basis. And now it looks like her healthy lifestyle has rubbed off on Christopher, as the pair stepped out together on Saturday while both sporting gym gear. The High School Musical actress and Annie Automatic frontman were seen leaving a Los Angeles restaurant together after lunch, with their arms lovingly wrapped around each other. Their workout wear would suggest that the pair had been on a hike or to an exercise session prior to their meal. Ashley, 27, showed off her amazing toned legs in a pair of teeny tiny black shorts, along with a baggy grey tank top which had an image of the American flag in a heart shape emblazoned on it. The blonde’s white sports bra peeked out from the low-cut sleeves of the top and the only colour pop in Ashley’s outfit came in the form of a pair of pink trainers with yellow laces. Meanwhile Christopher covered up in an all-black outfit as he wore shorts over leggings, along with a V-neck T-shirt, Adidas trucker hat with camouflage detailing and grey Nike trainers. On Thursday the couple attended the Hollywood premiere of Spring Breakers, which stars Ashley’s close friend Selena Gomez and her best pal and former High School Musical co-star Vanessa Hudgens. Ashley and Chrisopher have just returned from a romantic getaway to Hawaii, where they were spotted relaxing on the beach and playing in the sea together. The Hellcats star was taking a break after wrapping filming on Scary Movie 5, and before getting stuck into work on Left Behind, which she will star in opposite Nicolas Cage and Chad Michael Murray. That’s How she does it! Vanessa Hudgens turned herself into a walking advertisement for Pilates on Thursday. The Spring Breakers star showed of her flawless physique as she went to the exercise class in Los Angles, California. The 24-year-old has clearly been hitting the strengthening and toning class regularly as the she was able to show off perfectly defined legs – which did not have a hint of cellulite. Obviously the High School Musical star is proud of her hard work as she wore tiny purple tie-dyed booty shorts for the grueling class. The actress added a white tank to her workout look highlighting her tanned skin. On the the way into her class Vanessa covered up a bit more – except still kept her toned legs on display – wearing a grunge-inspired flannelette shirt with comfy ugg boots. Bending over to set up her Pilates reformer, Vanessa showed exactly what she has been working on. hile the other women in her class chatted and slowly set up, Vanessa was ready and rearing to go immediately jumping on the reformer and stretching. The star has previously spoken about her need to do Pilates thanks to a chocolate addiction. She told Self magazine she hits the gym at least four times a week, combining cardio on machines with spin classes and Pilates. She said to Self: ‘My secret to flat abs is Pilates. ‘I like sitting in the front row of cycling class. I feel like everybody behind me is looking forward, and that pushes me to do my best. ‘I look at myself in the mirror and get this really ferocious, angry look on my face like I’m about to kill someone. It’s crazy.’ The brunette beauty is certainly very dedicated to her working out regime as she went to the class just hours before she had to get ready for the Los Angeles premiere of her new movie, Spring Breakers, on Thursday night. The 24-year-old joins Selena Gomez and Ashley Benson to play friends who commit a robbery to fund their Spring Break. The film sees Vanessa spend a fair share of her time in her bikini – so luckily she has put in the hours at Pilates. Spring Breakers – which also stars James Franco – is already getting rave reviews, however most of the praise is reserved for James than his female co-stars. While technically the gritty independent flick was released last year at Cannes Film Festival, American moviegoers will get a chance to see Selena, Vanessa and Ashley turn into very bad girls on March 22. Alessandra Ambrosio Wows in Photo shoot! It’s not even spring yet but Alessandra Ambrosio has spent more time on the beach in a bikini than most people do during the whole of summer. The budy Brazilian model has been seen in swimwear for a number of days now as she shoots the upcoming beach season’s catalong for Victoria’s secret. But she clearly save the sexiest shoot for the sunniest californian day so far. While a day in a bikini is a day in the office for the stunning brunette , she looked like she was having a blast smiling and showed off her slender , yet muscular figure as she frolicked at the beach side setting. While the mother of two posed up in a number of outfits the photographer wisely choose to get the most pictures of her in a tiny black bikini. year a mere eight weeks after giving birth to her second child. So Adriana Lima knows she is onto a sure thing. The 31 year old Brazilian bombshell was seen indulging in her favourite exercise , boxing in Miami on Monday. With not a crap of make up on her flawless visage , The supermodel sweated it out as she trained at a gym in the Florida city alongside a slew of burly men. he raven haired beauty had a ball and was seen cheekily sticking her tongue out as she teamed up with a trainer who put her through her paces. Mother of two Adriana displayed her trim figure in a black v neck T-shirt and tight matching leggings. With her hair pulled back in a plait as well as showing off her boxing moves h the Victoria’s secret stunner did squats and lifed weights in the mostly male orientated gym.